Darcey Bussell launched the first six books in her Magic Ballerina series last October and since then a quarter of a million copies have been sold worldwide. 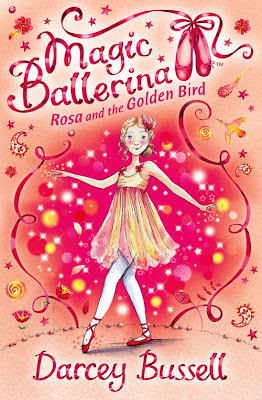 Now Darcey is back with the next six stories, which feature Rosa (a new character), who has inherited the magic red ballet shoes from Delphine (from the first series) and who has started learning ballet at Madame Za-Za’s school. Darcey’s charming books are aimed at readers aged 5-8 years, and what I like so much about them (though they are not aimed at adults !) is the authenticity with which Darcey, (now retired from The Royal Ballet where she was a Principal dancer from the age of 19), has been able to imbue the stories with genuine ballet steps. Along with the words, the pictures inspire young children to "have a go", and at the end of each book Darcey includes a master class of her own, showing that it too, could be you. Darcey and her two daughters provide the ideas and collaborate with her writer who weaves them into magical stories, including a special summer edition called “Summer in Enchantia” which is published by HarperCollins on 28th May 2009. I can't think of a better way to reward your child's great recital or the end of exams than with these authentically told ballet stories.